On June 15, 1936, Donald J. Burch, just 29 years old at the time, registered his own business as the Colorado Steel Sash Company. His journey would bring new ideas and new products and set the course for his life’s legacy. Two themes emerged quickly and continue to define the company today: innovation and integrity. Don started by making windows out of steel. It wasn’t long before he noticed that there was a great need for material to glaze steel windows, and do it neatly. (Like organic peanut butter, the oil in the window putty at the time would separate, creating a huge mess when applied.) As an English major from UCLA and the University of Denver, Don was an unlikely candidate for the chemistry lab. Nonetheless, he taught himself enough to turn out that first five-gallon batch of steel sash putty. Through continuous learning and experimentation, Don created a formula where the oil didn’t separate and would provide the neat appearance and easy application the other putty makers thought impossible. 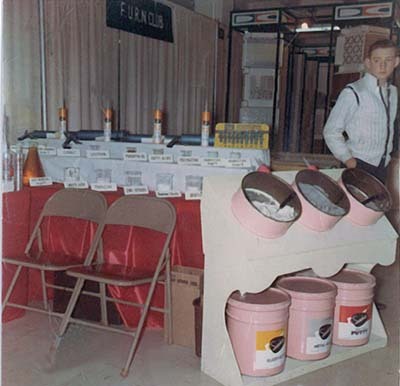 Throughout the next few years, Don expanded his product line to include both putty and caulking and, in 1941, began turning out both products in 100- and 200-gallon batches. In the same vein as Don’s putty formula, the caulking product was a first for the industry. Named Plastic-Sele, the formula was tough but flexible, a unique combination in a market filled with hard, brittle competitors. It was so flexible, in fact, that thin sheets were cast and dried and a message was typed on them (using a roll-it-through mechanical typewriter!) and sent out as samples. Much of Don’s success can be directly attributed to his high degree of foresight. He had an uncanny ability to anticipate and meet the needs of the future. One example: Besides being a self-trained chemist, Don was also a well-respected pilot. He used that skill to create an “airborne” sales force. Each salesman was trained to fly, enabling them to cover a multitude of distributors efficiently. The other part of Don’s success was due to his innate curiosity. (After all, how many English majors are self-trained chemists and successful pilots?) It was in his nature to invent and find a better way. In 1944, Don filed patents and copyrights on a navigational circular slide rule and plotter, which he later used as a navigation instructor at the University of Denver during World War II. Various other patents and inventions were par for the course for Don. His desire to discover a better way continues to inspire invention and innovation at the company today. Don’s integrity and commitment to making products that work earned the company a reputation that quickly broadened. Unfortunately, his was a story that ended far too soon. 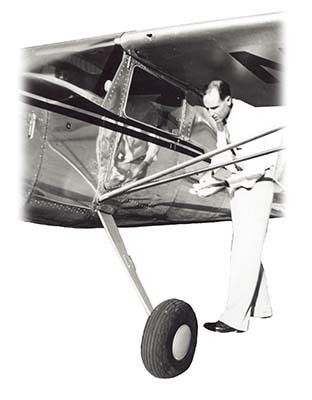 On June 20, 1954, at just 47 years old, Don died in a private airplane crash. He left behind his pregnant wife, Alice, a four-year-old boy, and a thriving business. Don once told his wife Alice that if anything ever happened to him, the company would continue to grow by sheer momentum for five years and then begin to decline unless new visionary leadership was quickly identified. His prediction came true. By 1964, the company was nearly bankrupt. Alice was alerted to the difficulties by her nephew Gary Schneider, who had joined the company a few months earlier as production manager. Upon his warning, Alice took over company management. At the close of 1964, the company had lost 25% on $240,000 in revenue and barely clung to life. But Alice would not accept defeat. Her determination and common sense breathed new life into the company. Within two years, Alice erased all red ink and the company was profitable once again. While Alice worked diligently to fight for the company’s survival, she did not go it alone. Alice had the support of her family along the way. Besides her nephew Gary, Alice’s sister Lavone and daughter Alyson worked in accounting. Her son, Les, and another nephew, Steve, worked in production over the summers, making the rebuilding years a true family effort. Alice revived Don’s innovative legacy by updating product packaging and testing new concepts. One of her first attempts to differentiate products was the introduction of pink putty pails. Unfortunately, the predominately male glaziers weren’t as thrilled with pink as Alice was, so the pink putty buckets only lasted a few months. But it showed that she was not afraid to try new things. Alice knew that the path to successful innovation meant missteps were inevitable and necessary. Also during her tenure, the company began producing Acrylic Sealant, its first water-based sealant that would become one of its flagship products. 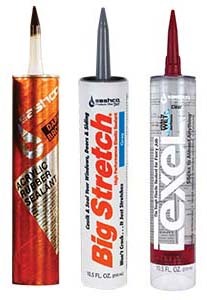 That product is still sold today under the name Big Stretch® and is a recognized leader in high-performance acrylic sealants. Alice’s achievements did not go unnoticed. In 1976, she was recognized by the Rocky Mountain Paint and Coatings Association, where she was one of only five women awarded for her leadership and contribution to the industry. As Alice’s tenure began to wind down, Les Burch came to work for the company full-time. It was 1972 and he had just graduated from the Colorado School of Mines with a degree in Chemical Engineering. The company officially changed its name to Sashco, Inc. that year and, just one year later, named Les president. Les found himself in the unusual role of leading the company and continuing to build his family’s legacy just one year out of college. While Les’s education in chemistry prepared him to design and formulate the products, it didn’t quite prepare him for company leadership. But he was an ambitious young man. He brought a fresh, vibrant energy to the company, reminiscent of Don’s early leadership. Today, after more than 40 years as Sashco’s president, Les has assembled a dedicated staff of over 100 employees with the same energy, ingenuity, and customer care that has long characterized Sashco. In the mid-1970s, the company renamed Acrylic Sealant to Acrylic Rubber Sealant and launched a brand new retail display. Called the AcryColor display, it broke new ground by featuring a colored nozzle that matched the color of the caulk inside the tube, a first in the industry and now the industry norm. Then, in 1976, Wayne Summons, Les’s classmate at college, joined the company. Les recognized Wayne’s superior talent as a chemical engineer. Wayne’s penchant for innovation and invention was a natural fit. (In fact, Wayne is the inventor on record for several U.S. patents, including that of Lexel® and eXact color®.) Twelve years later in 1988, Wayne was named vice president of research and development and technical director, a role he still serves in today. For many businesses, the 1980s posed one of the most difficult economic climates since the Great Depression of the 1930s. For Sashco, the 1980s proved to be one of the most innovative decades in company history. First up: Les’s Alyster stop-flow plunger. Introduced in 1982 (and still used in all 10.5 oz. cartridges today), his was the only plunger to stop the flow of product after pressure had been released from the caulking gun. The clever design resulted in less waste and less mess (and happy customers). Until the mid-1980s, Sashco produced sealants solely for conventional home construction. It was during this time that the company discovered people using Acrylic Rubber Sealant to seal their log homes. Sashco’s high-performance products were particularly suited to the unique rigors of log homes, so the company introduced a full line of high-performance, specialty log home products. Sashco quickly became the standard for product performance for this niche market. In 1986, Sashco experienced another milestone in the company’s road to success when they introduced Lexel®, a product that would forever change the sealants market. Lexel® was the first–ever clear sealant in a clear cartridge. The clear cartridge was a first for the industry and was exclusive to Sashco for several years. Lexel® outperformed the industry-giant silicone with superior clarity, paintability, and adhesion to almost any surface and won over scores of loyal users. Lexel® single-handedly took Sashco from a solidly growing regional company to the national stage, tripling the company’s size in less than three years. Innovation at Sashco during the 1980s also applied to strategic thought. Throughout the years, Sashco would often introduce a product just to match competitors. By 1990, the decision was made to focus on doing what Sashco does best—making high-performance products. The company eliminated 75% of its product line in this massive strategic shift and narrowed its offering to just two niche products—Lexel® and Acrylic Rubber Sealant. Much of the staff was downright afraid that the company would go under. Instead, Sashco’s sales increased. Since that time, Sashco has focused exclusively on making high-performance products that work right the first time. In mid-1990, the idea that product names and packaging should be more about important customer benefits, and less about the product technology, was taking hold inside the company. In conjunction with the new strategic focus on high-performance products, a major name and packaging makeover took place. Acrylic Rubber Sealant was transformed into Big Stretch®. In a market where manufacturers were still using chemical names for products, this was certainly risky, and far ahead of the curve. The new name and redesigned packaging now told users that this door, window, and siding sealant would do exactly what they needed—stretch! The concept was overwhelmingly successful, and Big Stretch® drove new company growth. In the mid-1990s, Sashco saw the opportunity for further growth in the log home market and introduced a high-performance semi-transparent stain. Sashco took sealant technology and applied it to log home stain with their Capture® Log Stain and Cascade® Clear Top Coat system. This water-based stain system combined the elasticity of a sealant with the beauty of a semi-transparent stain to create a hardy, durable finish. To this day, representatives with some of the biggest stain manufacturers uphold Sashco’s Capture® and Cascade® as the standard in high-performance stain technology. Sashco moved to a new manufacturing facility just outside of Denver in 1995. In the 20 years since, new products have been launched, technology has evolved, and Sashco continues to be a performance front-runner in the sealant and log home products industries. Fact: 50% of businesses fail within the first five years. So how does a business avoid becoming a statistic and succeed for eight decades? Popular wisdom says it’s innovation, reinvention, and adaptation. While these are important, they aren’t foundational. A culture of integrity is foundational and this culture has kept Sashco alive and thriving since 1936. A culture of integrity goes beyond just telling the truth. It forms a values base of fairness and consistency and is evidenced in our everyday actions and beliefs. When integrity slips, handshakes give way to long legal documents, promises become lip service, and people look more for what they can get and not what they can give. Sashco has thrived because integrity was its foundation from the moment Don registered the company and throughout the rebuilding that Alice led. Our five core values of truth, trust, care, forgiveness, and respect reside in the hearts and convictions of each person at Sashco. These values underscore every new product created, every hallway conversation, every business decision. Our message is not that we are so much better than other companies, but we do enjoy great clarity about who we are. We aim to Live Our Values and, through that, Impact Our World.